Boat Description Pro Team 175. THE WORLDS BEST SELLING FISHING BOAT package. With angler-preferred layout and features, this is simply the industry`s best value. The exclusive all-welded Revolution hull (with Smooth Ride Guarantee) delivers the smoothest, driest, best handling ride. 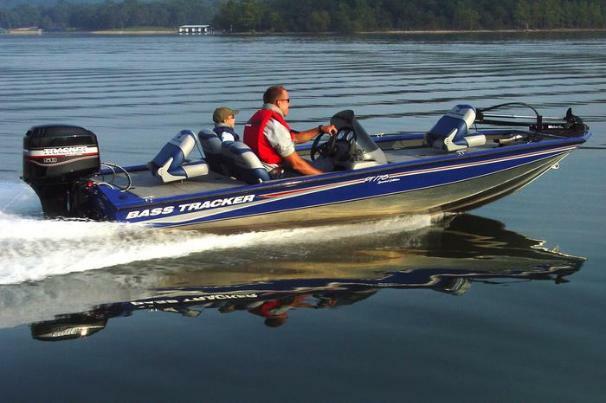 Ready to fish for bass or bluegill, the Pro Team 175 comes equipped with a Mercury Pro Series outboard, Lowrance X37 fish finder, MotorGuide foot-controlled trolling motor and aerated livewell with timer, recirculation and pump-out. Roomy cockpit with three-across seating. Sleek, painted hull sides and gunnels, with natural aluminum bottom for durability. This fully featured package includes our easy-to-tow custom trailer with GalvaShield protection, EZ lube hubs and swing-away tongue. Dry Weight 943 lb approx.